Forgetfulone: For All of my Cooking and Baking Friends! The winner will receive a brand new Hamilton Beach 4.5-qt. 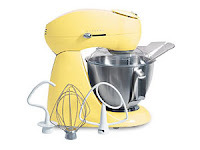 Eclectrics Stand Mixer, Pineapple Yellow! !